A Sea Level Rise Conundrum – Greenland’s Cycles | Watts Up With That? After France fell to the Nazis, Britain desperately prepared for an invasion. The United States shuttled hundreds of planes to England via the Snowball Route, a series of secret bases on Newfoundland, Greenland and Iceland. But in 1942 one squadron never completed the journey. A sudden July storm forced 8 planes to land on a slushy glacier surface in southeast Greenland. Although the crews were rescued, later attempts failed to locate the Lost Squadron. The glaciers had ferried the planes miles downstream as they were increasingly buried in ice. One plane was finally recovered in 1992 and the second, recovered in 2018, was under more than 300 feet of ice. 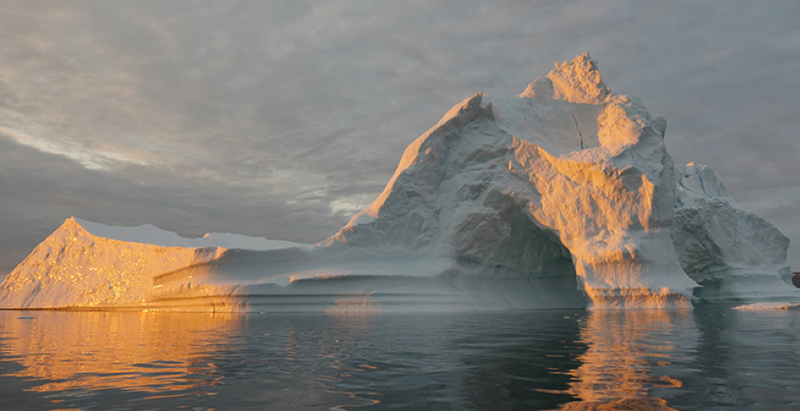 Southeastern Greenland had been gaining ice at a rate of 4 feet per year. In contrast, climate scientists project Greenland will increasingly lose ice as CO2concentrations increase. Indeed, its melting ice has been the biggest contributor to accelerating sea level rise for 2 decades. But that is rapidly reversing. City planners along California’s coast are struggling with competing theories. How much sea level rise should we plan for? Fearing an accelerating rise, some argue we abandon the coast. Others argue, and I agree, we should protect our homes with seawalls. But how high must we build? Understanding Greenland’s contribution is critical. If we removed all ice from Greenland, the land would reveal a bowl-shape. 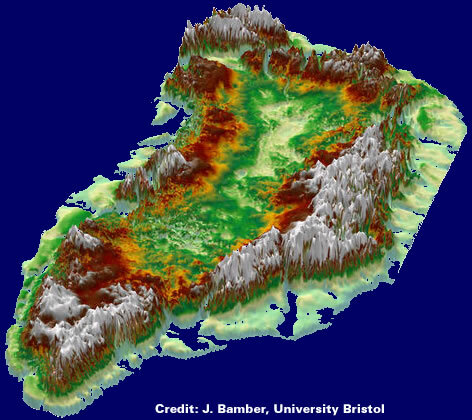 A ring of mountains paralleling the coastline prevents the ice cap from sliding into the sea, no matter what scary climate stories suggest. Several gaps in those mountains allow glaciers to transport ice from inside “the bowl” to the oceans. Given enough time the Lost Squadron may well have been shuttled out to sea. Whenever more ice accumulates inside the “bowl” than leaks out via glaciers, Greenland gains ice and sea levels fall. If more ice reaches the ocean than accumulates inland, sea level rises. But predicting any imbalance is difficult. During the last 100 years, Greenland oscillated between gaining and losing ice. Its greatest loss raised sea level by 0.07 inches in 2012, about half the total sea level rise of 0.12 inches a year. That accelerated loss was trumpeted as just what climate models predict. However, Greenland’s melt rates then declined and by 2017 it was gaining enough ice to slightly reduce sea level rise. A similar warming and melting episode occurred decades earlier. Climate scientists determined Greenland had warmed most rapidly between 1920 and 1940. As reported by the IPCC, “temperature has risen significantly since the early 1990s, reaching values similar to those in the 1930s.”Regards accelerated rates of sea level rise from melting ice, the IPCC reported “It is likely that similarly high rates occurred between 1920 and 1950.” Intriguingly, much lower CO2concentrations still resulted in similar warming, melting and rates of sea level rise. Until Greenland’s temperatures and ice-melt exceed the 1930s episode, scientists cannot distinguish between natural variability and human-caused warming. The current trend is too short to be certain, but the past 2 years suggest Greenland is now entering a cooling cycle. In fact, based on my analyses of published scientific reports regards decades-long cycles of migrating fish into and out of the Arctic, and circulation effects of Atlantic oscillations, I boldly blogged in 2014, we would soon see Greenland begin to gain ice, as it is now doing. Of course, that prediction was attacked by the ill-informed. They claimed my analyses of published scientific observations was cherry-picking, pseudo-science and I ignored the (mythical) 97% consensus. My response is always, there is absolutely no consensus regards climate’s sensitivity to a doubling of CO2. Some IPCC experts predict 1 degree warming, others predict as much as 5 degrees. Nonetheless the scientific method demands, to prove rising CO2 is causing an effect like melting Greenland ice, we must show current changes exceed past natural variability. But most people are unaware that has yet to happen. We are an adaptable people. Seawalls we build to protect our coastal homes for the next hundred years, likely need to plan for just 8 inches of sea level rise, but certainly not 5 or 10 feet. Yet to be confident, we need another 20 years to determine the contribution of natural cycles. Is Satellite Altimeter-based Sea Level Rise Acceleration from a Biased Water Vapor Correction? That’s 0.8 mm/y out of the current SLR of 3.0 mm/y or 11.8”/century. Probably those barely 20 millennials with their participation/entitlement PhDs. Every year Greenland “loses” 500 Gt during the summer and gains it all back in the winter. Excellent addition to the original post. True of almost every claim made by alarmists. Good examples are Sea surface temperature and ocean pH claims which even if they were supported by credible data would be totally insignificant in any case. Even the claimed global temperature increase of (is it 9/ 10ths of a degree in 100 years now) is not supported by robust data and is also totally insignificant even if doubled. From my perspective and 70 years of personal observation I would hazard that our winters are slightly warmer and our summers cooler for a slight net increase in temperature. but even that is totally insignificant except to make life a little more comfortable in my locality. Predicting the next 70 years is like putting all your money on a lame horse. The only thing certain is that there will be change so put half your money on colder and half on warmer and you will at least break even. I am trying to say that we should be prepared for either eventuality as any attempt to control global temperatures through the regulation of CO2 is doomed to failure due to a purposeful lack of compliance and other instances of an impossibility of compliance. The point is that even if CO2 is the control knob of climate we will have to live with the results. So get used to it and fix your house while paying some attention to problems that can be reasonably addressed. “Poofteenths” is the most apt unit for measurement of AGW effects. The pH scale is log so every number is a power/factor of ten. pH is the negative exponent of the hydrogen ion concentration. For instance pH 9 is 10^-9 or 1 part per billion, .000000001.
pH 8 is 10^-8 or 10 parts per billion. To go from pH 9 to pH 8 is factor of 10 or 1,000%!!!! Makes 26% look trivial. pH 8.2 to pH 8.1 is a change in H ions of 1 ppb. I’m fairly certain the ocean flora and fauna don’t even notice. Agreed. Full disclosure, so was mine, Farmer Ch E retired. In very small part. And I am grateful. Of course it may mean that my potential employment at NASA now shrinks to zero, but calling out bad science is what they (taxpayers) helped pay for me to learn. MH – Thanks – since my handle includes “retired,” future employment by NASA is a non-issue for me. Most of NASA is not wound into this so hopefully they are still doing much good science as a whole. The satellite ice measurements were already suspect. This has been discussed here before several times. They need a model to be able understand what they actually measure and depending on the parameters supplied to that model the ice volume has either increased or decreased. The issue is that no one seems to simply calibrate such models. For example the ice-extent of the Antarctic has grown over the last decades, which or course is not compatible with an ice-volume loss over the same period. Yet that is what is reported based on those satellite measurements after processing via that model. Clearly their model and/or parameters are wrong. “Tide gauge is still 1.8mm/year not 3mm/yr”. – 1993-present: 3.2 – 3.6 mm/yr (depending on who did the evaluation). Bindidon – Did you just point out one of the inflection points in the spliced tide gauge data and satellite data? Can you reference the source of the 1993-present data? Ooops! I replied to your comment, but… it is no longer there. The comment posted o March 22, 2019 at 2:25 pm was not visible to me, and thus I sent a new one. Please remove one of the two! The comparison of tide gauge sea level data with satellite telemetry is for the satellite era only and both trends are correlated with straight trend lines that follow one another closely without upward acceleration. It is interesting that the tide gauge trend data from NOAA for individual tide gauges also follow linear trends w/o upward acceleration for the entire tide gauge data record to the present. How can the tide gauge trends be linear with 1.8 mm/yr rise before 1993 and 3.2-3.6 mm/yr after?? If it were natural, one would expect the acceleration to increase with time but that is not apparent from the data. It appears as if the tide gauge data were homogenized/manipulated to achieve the higher linear rate after 1993. It is hard for me to believe the post-1993 data in your link is authentic when I examine individual tide gauge records from NOAA. I’ll give Willis a shout out and perhaps he can evaluate the data provided in your links. Can I add the sea ice volume? Assuming sea ice to be 1 metre thick on average, then the melt/refreeze of 11 million square kilometres of sea ice each year is 11,000 cubic kilometres of ice every 6 months. A cubic kilometre of ice weighs 1 gigatonne. 11,000 gigatonnes is just the annual Summer/Winter cycle, the smaller figures are just blips. A strong case can always benefit from a concrete and compelling anecdote like the fate of the lost squadron. However, a compelling anecdote does not and should not be allowed to make a strong case. 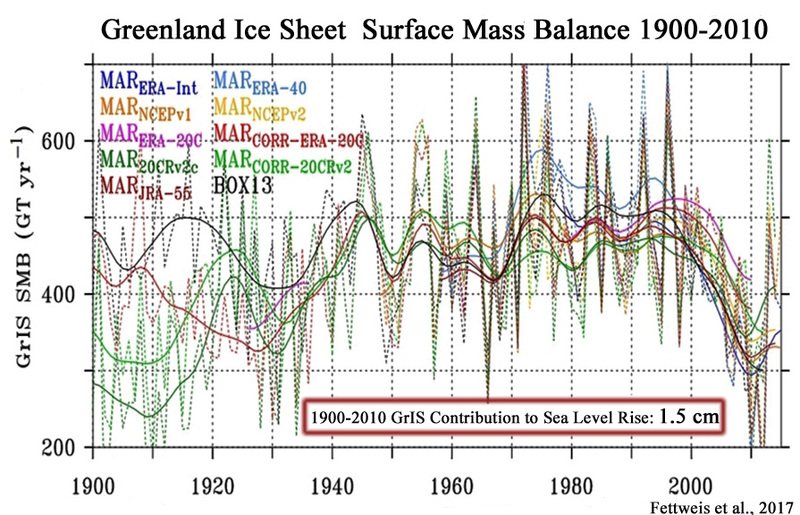 A chart showing the trend in Greenland’s ice mass (or loss thereof) would be a good addition to this post. DMIs graph is quite easy to understand. Does it show us the Long term trend in Sea Ice or Greenland Ice? Or have I been looking at the wrong Graph? What I have been looking at is the Surface Mass Balance graphs. I don’t think sea ice applies much to Greenland. However, my recent visits to the DMI site find them in Danish with no toggle for English. Figuring out why is not top of my list. Many infos proviously available at DMI below dmi.dk were transferred to the polarportal site. I’m with Bernie. A “…concrete and compelling anecdote…” written in the English language should not be allowed to make a strong case. Instead, show us some cartoon pictures with a zig-zag line – either zig-zagging upwards, or zig-zagging downwards – THAT is what will convince us. It’s like the ice levels at the North Pole. I had my doubts until I saw the cartoon animation of the North Pole ice. Sure enough, in the cartoon, you can easily see the ice disappearing! That convinced me. If you tell me it is increasing, and show me a cartoon picture of a zig-zag line trending upwards, THEN I’ll believe you. If you tell me it is decreasing, and show me a cartoon picture of a zig-zag line trending downwards, THEN I’ll believe you. But, simply writing the truth of your claim in English words is so… Old School. Show us the Cartoons! I think it depends Bernie. It depends on what you are measuring. 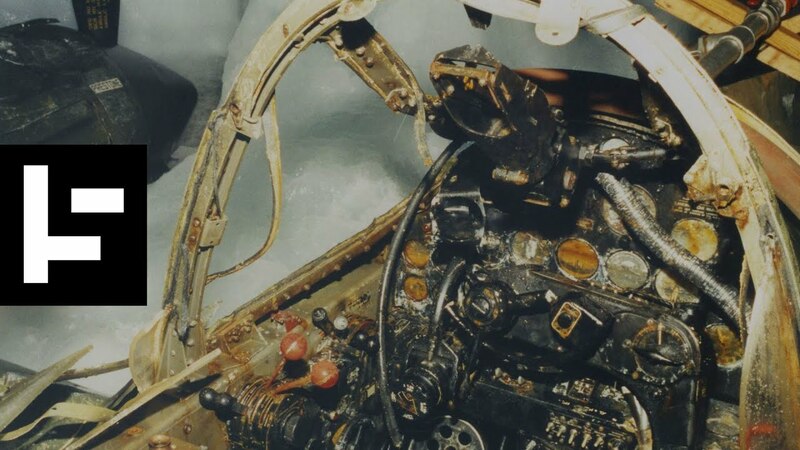 The existence and depth of the lost aircraft are facts that provide observational evidence about conditions. If, for example a model said that the Greenland cap would get 4 inches of snow each year, then this is a prediction to be measured. 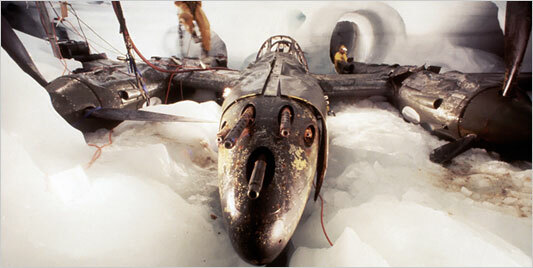 The location of the aircraft under 300 feet of ice shows they buried at a rate far more than 4 inches per year. Remember that anecdotes are only “anecdotes” until they get written up for a journal, then they become “Case Studies”. We know that ice becomes liquid by pressure. Did they consider sinking just by the weight of the planes in their calculations? The Creation Museum is all over the lost squadron. It’s an impressive sales job in a number of ways. Among other things, they tell you stuff. You go out of there knowing what the Germans called the P38, what its armament was, etc. This adds to the plausibility. They tell you, correctly, that fighter aircraft were nose heavy–guns, armor, engines. Unnecessarily but to add to the plausibility, they tell you that control surfaces were designed to allow for level flight–presumably with controls centered. And, since the aircraft are nose-heavy, they’d sink nose-first through the ice and be found nose down. But they’re horizontal. Thus, the stuff on top of them came down on them. They also review the experiment where you get a block of ice and two weights connected by a copper wire. Strap the wire over the ice and it sinks into the ice, showing the melting by compression heat. But, they say, the demonstration fails to take into account the ambient heat absorbed by the copper wire and weights. This and the Ark Encounter are done really well. Mostly, they take a premise–The Flood–connect it by some obvious natural processes (Mt. St. Helens, ex) and come to the Young Earth conclusion. Heck of a sales job. Worth a look if you’re heading that way. But, anyway, if the aircraft sank, somebody needs to explain why they weren’t nose first. Anyway, their conclusion is if you can get 250-300 feet in fifty years, how on earth can you get an ice core that is in tens of thousands of years, or even thousands of years? There goes the whole AGW hoax, or whatever its called now. But if the trend had not reversed, I guarantee they’d have assigned some large proportion of the loss of ice to anthropogenic forcing. In Squiggology, it’s that easy. My wife was watching a recorded episode of “Madam Secretary”, I don’t know when it originally aired, but it was so full of climate change nonsense, I thought it was a comedy. They had a “scientist” character that said “It used to be that we couldn’t positively link a single storm event to climate change, that time has passed.” Riiiight. The rest of the show was about trying to save the population of a coral atoll island from a super typhoon, calling them all “climate refugees”. And, of course, there was a group of “deniers” that was blocking congress from enacting laws to prevent such disasters. It must have been a fairly recent episode because it is only in the last couple of years that Alarmists have gotten so bold/desperate as to claim to see a human fingerprint on every extreme weather events. It used to be, just a few years ago, that the Alarmists would predict CO2 would be affecting the weather when the temperatures increased substantially, as they were claiming the temperatures would, and these enhanced extreme weather events would not be occurring for some decades to come. Now, the timetable is sped up, and these fools are claiming to see CAGW in every thunderstorm. They are seeing what they want to see, not what is there. But the poor ole general public doesn’t know that. The records from the past do not support the claim that we are seeing more and stronger extreme weather events. Nothing unprecedented is going on with Earth’s weather. Most television programs today are not much more than Leftwing/Gangsta lifestyle propaganda. All of them are destructive to the fabric of our societies with their promotion of violence and division in their screenplays. I pity the poor kids who only has this trash to watch. Good luck trying to figure out how the real world works. The Left isn’t kidding when they say they want to completely remake society. First, they have to destroy the present society, which is happening now, and then the new Leftwing Utopia (Venezuela-style) can be introduced. Hey, I wasn’t watching it. I was doing something much more constructive (playing video games). So… your cat STILL needs washing? Come on, Jeff. Go get the hose and get it over and done with. AH! But have you read “Cat Bathing as a Martial Art”? I want to know how anyone could reasonably conclude that if warming in this century exceeded warming in the last, or if any warming period post 1950 exceeds warming prior to 1950, that this must mean the difference can be attributable to CO2? Who can say that warming at some previous time, that was not CO2 caused, is the maximum possible warming due to natural variation? If it warmed 0.5 degrees from 1910 to 1940, how can it be assumed that that was as fast as natural variation allows? Ice core samples show no linkage between CO2 and temperature. The PhD’s studying Greenland’s ice are on a mission to confirm the predictions of their (alarmist) community. They’ve learned in school that it is just a matter of time before CO2 creates the “tipping point” when melted Greenland ice will end up in the basements of shoreline homes around the world. But the measuring instruments of their mission could end up like the ill-fated WW2 squadran… hundreds of feet below the frozen surface of that frozen land. Empirical evidence tends to suggest the latter will be true. The real tipping point will occur when they can’t get funded anymore, and they know it well. There is no virtue, for them, in saying “Actually, it’s OK. Nothing unusual to report. These aren’t the disasters we were looking for. You may go about your business. Move along. Move along”. Do you mean they actually go there? Right. Or walk away from the beach until you’re at cement block elevation. 8 inches suuuure. . .
Seawalls don’t work in every case. Long shore drift on the Southern New England coast, for example, moves sand from west to east. That’s why Cape Cod has its shape. The drift cuts under seawalls unless it’s deflected by groins and jetties, but these can be hard to configure and maintain against the effects of large storms. In areas such as this, affected by hurricanes and intense winter storms, the better choice is to refrain from building so close to the water. How that happens will be a battle between public and private forces, wealthy arrogance and non-wealthy jealousy, current desires and historical fact. Indeed Gary, seawalls can have problem. Here in Pacifica a few houses were dangling over the sea bluff edge. The northern half of the city is located on loosely consolidated sediments that erode with every El Nino. It would have been smarter to build further back but back then people were unaware of how fast the bluffs could erode. So ow we have a legacy problem. Abandon the coast and sacrifice all the homes and businesses or build a wall. SF placed a sea wall at the end of Golden Gate park in the 1920s. It has been solid and the beach has grown. I would include a jetty “upstream” of the prevailing longshore currents so the currents can deposit sand behind it and build up the beach in front of the wall. Acerbated by the taxpayer-funded flood insurance program that allowed new construction in locales with high potential to flood without economic consequences for the owner. This was meant to help poor people who lived in flood-prone areas. The law of unintended (if not unforeseen) consequences is still valid. If we had not meddled in the insurance market, only people rich enough to pay a private insurance company the market rate for flood insurance would build. Most developers would stay away from these projects because people wouldn’t want to pay for the much more expensive flood insurance. People, as it turns out, are loath to abandon their property. And politicians are not exactly in the habit of recommending that storm damaged homes are written off either. In fact, the usual call is for urgent relief and rapid rebuilding, often with aid from the federal government. Even places like New Orleans after Katrina, which is actually below sea level and sinking more every day, or homes that were on or near the beach damaged by Sandy, which will surely be similarly flooded again and again, eventually, were never seriously considered for abandonment. The opposite is true: Any authorities who were seen as hindering efforts to put things back as they were, has their head handed to them. As has always been the case, the day to day tidal variations are far larger than the rise over even a century, and what the tidal conditions are when the storm hits have the biggest influence on how bad the damage is. California has seen zero acceleration of sea level rise, and the ocean is rising slower there than most places around the world. Physical geographers have a name for a coastline with the characteristics seen on the West Coast: It is called a shoreline of emergence. As opposed to shorelines with barrier islands, called shorelines of submergence. Cookie for anyone who can guess why. The bay is there because the Hayward fault is shoving east, creating a huge fault graben. The land between the Hayward fault and the San Andreas is dropping, as the faults move apart, this is why the bay is there..
Up the coast near Mendicino is a park where there is stair step geology. There is a series of flat former coastal lands now elevated hundreds of feet over thousands of years. Each step about 100,000 years older than the one closer to the Pacific. I tell you what does work, Here in the Gulf Coast we put our homes on stilts. Really, Greenland is melting? What’s the average temperature on the Greenland ice cap? Does it ever get above freezing? Well I suppose it does once and a while. We are regularly treated to beautiful blue surface rivers entering moulins. But how much water does that represent? Not much is my guess. The change in the ice mass of Greenland isn’t the surface ice melt, it’s the difference between how much it snows and how much ice calves into the sea as ice bergs. I mean really where are the rivers that are discharging all this water to run sea level up? Well they are there, but they are ice rivers. To put it bluntly, I’m sick and tired of hearing about Greenland and Antarctica “Melting”. They might be losing ice, but it doesn’t have anything to do with temperature – one of the many lies foisted on us from the climate cult. I wish people would stop allowing the climate cult to set the agenda with dogma that way too many people don’t ever seem to question. If someone wants to take issue with that, have at it. And if you do, don’t start with the deep warm water flowing under the sea ice and under the ice shelf melting the ice at the grounding line claptrap. Ohhh! You cursed brat! Look what you’ve done! I’m melting! Melting! Oh, what a world! What a world! Who would have thought a good little girl like you could destroy my beautiful wickedness! Ohhh! Look out! Look out! I’m going! Ohhhh – Ohhhhhhhhhh! In the pointy little heads of Gang Green fantasy trumps reality every time. Ahahahahaha….Well! Ring around the rosie, a pocket full of spears. Thought you’d be pretty foxy, didn’t ya? Well, the last to go will see the first three go before her. Hahahaha. And her mangy little dog, too. Ice melts from below, not from above. That would make sense since it was just as warm during the 1930’s as it is today so similar melting should be expected. Mother Nature heated things up in the 1930’s, then cooled things down through the 1970’s, and now Mother Nature is heating things back up like She did in the 1930’s. More evidence that the 1930’s were as warm as today, despite the Climategate Charlatans bastardization of the surface temperature records where they artificially cool the 1930’s into insignificance. The Alarmists wouldn’t be able to claim we are experiencing “unprecedented heat” today if the 1930’s were just as warm, so they change the temperature record to make things look like they have been getting hotter and hotter for decades. The truth is the Earth warms up for about 35 years or so, then it cools down for about the same amount of time, and then it warms back up. Up, Down, Up, Down. Not Up,Up,Up,Up, as the Alarmists would have us believe. Average temperatures don’t melt ice. Local temperatures do. If one area is 20F and another area is 40F, on average, it’s below freezing. However the area at 40F is still going to melt. So even though the moon’s “average” temperature is lower than the earth’s the moon is a blazing hot/bitter cold barren dirt ball and not an ice ball. There’s a great big 0 to 5 days area of summer melt for most of the ice cap. Are there really 30+ days on the north slope? Well anyway, there’s not a lot of melting occurring on the ice cap. Greenland having lost ice from the 1920’s to the 1940’s is consistent with the warming period minimized in the “corrected” temperature “records”. 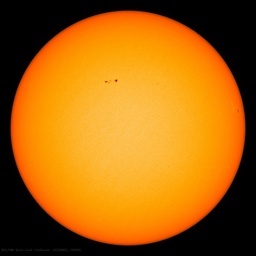 How is that possible since according to authorities, media, children, experts and last but not least, 99.9999% of scientists, climate science is settled ? Your link is not working . The alarmist have pushed to idea that most of the glacier melt is post 1950 to demonstrate that the melt is due to AGW. Unfortunately, there is very limited photos, graphs, data, etc available online showing the amount of melt pre 1950. The p-38 recovered in 1992 was renamed Glacier Girl. Here is a web site with the history of that plane. I looked at the DMI website and found that this current year (2018-2019), as of yesterday, ice accumulation is well below the 2011-2012 season (a “high loss” season) and the 2017-2018 season (a “no loss” season) for this date in each season. It will be interesting how this evolves with time. Meanwhile, Iceland’s glaciers are growing for the first time in decades. Bardarbunga or Grimsvotn can fix that quite fast. Are those two naughty boys receiving payola from CO2? That not only applies to Greenland ice, it also applies to the Earth’s temperatures. Current Earth temperatures have not exceeded past temperatures. The Earth is not in unknown temperature territory today, despite the Climategate Charlatan’s claims to the contrary. It’s been as warm or warmer in the past and that level of warmth did not harm the Earth or wipe out its inhabitants. So the current level of warmth is not going to hurt anything, either. CAGW is a criminal fraud. Jim ==> Great write-up on data usually consigned to the hidden file draw of “results we’d rather not let anyone see”. While I generally agree, I take some exception to the idea that “to prove rising CO2 is causing an effect like melting Greenland ice, we must show current changes exceed past natural variability.” It is quite possible that natural variation in the future could cause a larger change than it has in the past — the past does not necessarily contain the upper limit of natural variation. “Natural Variation” is just a jargon-term that means “all the causes that we are unaware of that are responsible for changes in climatic features”. It is certainly possible that some of those unacknowledged causes could combine and produce a result larger than those seen in our limited data set of the near-past. Exceeding past variation is definitely a minimum requirement for the declaration of “caused by CO2”. Agreed. I’ve never understood the assumption that the earth’ climate is like a 33 1/3 LP Album, wait long enough and it will repeat precisely what came before. Everything on earth constantly changes , from geology to geomorphology to Oceanic cycles to the solar system. We will always be on uncharted territory. Keep up the good work Jim.It needs people doing things like this on a local level to get people that have never given consideration to what is being proposed to “save the planet” and how much it costs them personally. In conversation i find it takes little prompting to get someone to repeat one of the many prophecies of doom and they are mostly easy to dispel with some sound logic and a bit of history. Kip: “Exceeding past variation is definitely a minimum…” Yes when past variation is largely proxies, which give smoothed multiyear data. Climastrologists never seem to want to address what effect the high heat flux from thousands of geothermal vents beneath the ice cap might have. I think it would be error to assume that those fluxes never vary. The Arctic temperature, Himalayan monsoons and the Earth’s core magnetic field have a common periodicity ( cycle ) of 16 years. The cause of such behaviour is not known but I suspect it is to do with the changes planet’s angular momentum due to transfer of large volumes of water in the north-south direction and vice versa ( movement of mas in respect to the axis of rotation). Jim, that thinks sink in the ice in Greenland doesn’t mean that Greenland is gaining ice. The ice sheet in Greenland is the result of two processes. Surface mass balance is positive almost every year for Greenland, that receives more snow than it melts. But Greenland also loses ice from the sides through iceberg release and seaside melting. The total balance has been negative for most years since there are estimates. 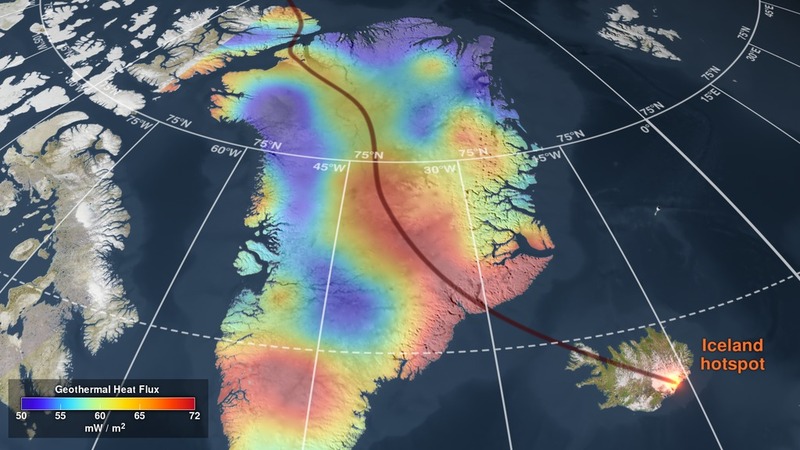 The result is that anything left on the surface of Greenland ice sheet will sink in the ice and over time it will be displaced laterally towards the sea. That is why they have to chose dome summits to drill the ice cores because those are the only places where ice only sinks over time without lateral displacement. There is melting at the bottom of the ice sheet besides ice compaction that favors the sinking. The melting is what limits how old the ice is in Greenland, so while you can get back to ~ 1 Ma in certain places of Antarctica you can’t get ice older than ~ 130,000 years in Greenland and even that is very difficult. The Danish Meteorological Institute has some pages explaining changes in Greenland ice sheet. AFAIK metal objects slowly sink in the ice. I’m not sure about physics or even chemistry of it, ice is presumably an ‘ amorphous solid ‘ so maybe it is slight difference in pressure that object excerts above and below. It possibly could be something to do with metal being conductor and ice is dialectic, together making an electric capacitor with ground surface below. Metal conducts heat pretty good, certainly when compare to frozen water….So when metal is in contact with ice it will certainly transfer more heat energy to the ice then rock or air. With sufficient energy available in summer (sun & length of day), the metal will eat into the underlying ice en sink into it. Accumulation on top of those planes will visually seem to result in much larger than actual the ice growth and should definitly not be used to project total ice accumulation…..
Was there some sinking? Probably. How much? Density controls sinking. Is a hollow fuselage less dense than compressed ice? Probably. So it is fair to assume little density driven sinking. Can a metal plan serve as a good conductor. Well it may warm in the summer sun the first year but after the plane is buried it will not be warmed. If a plane and ice reach equilibrium with a -20 winter temperature and is then buried by insulating snow, conduction is no longer a factor. Recent ice mass loss could result from more cosmic rays causing more low level clouds which cause cooling (didn’t happen). Or, just possibly, better north/south heat flux from a less stable polar vortex causes warming seas and higher air temperatures around Greenland and the rest of the arctic, but cooler temperatures elsewhere. There is too much emphasis on clouds causing cooling. Javier I am not sure what you are trying to say. But that is rapidly reversing. I don’t understand why you say this. Precisely this season’s surface mass accumulation is below average. There are oscillations of ~20 and ~65 years in sea level as in many other parts of the system. In fact I predicted in 2017 that sea level rise should decelerate a little due to the 65 year oscillation over the next couple of decades. For the past 3.5 years it has been correct, but it is too early to tell. But the long-term trend is very clear. The cryosphere retreat is being driven not only by the temperature increase, but also by the increase in light absorbing particles in soot produced as a consequence of industrialization and biomass and fuel burning tied to population increase. There is not going to be a reversal in that for decades. The cryosphere recession is what makes the current climate change unusual. It is the only phenomenon in the climate system that shows a clear acceleration. And it is driving the sea level rise. The long term trend is definitely NOT clearly suggesting increasing melt unless what you are calling “long-term” begins in the late 90s. There were several papers reporting Greenland was acting contrary to global temperature estimates. They noted a cooling trend since the 1940s. Read “GLOBAL WARMING AND THE GREENLAND ICE SHEET ” CHYLEK 2004. Chylek correctly suspected changes in cloud cover as the controlling factor. Since 2012 trend of increasing melt reversed with decreasing amounts of ice loss. and then Greenland gained ice for the past 2 years. I said it is too early to tell, but this may be the start of a cooling trend as was the case after the 1940s. That doesn’t mean that some years may still lose ice. 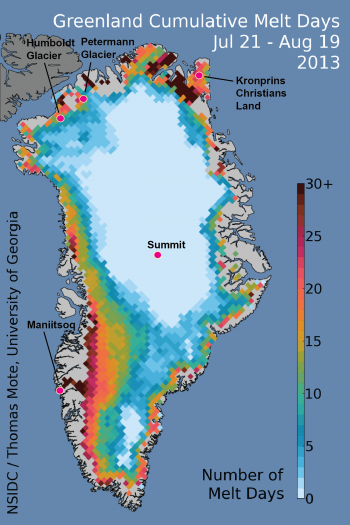 To date Greenland ice accumulation is below average, but that is not due to melting. It is due to how storms transport precipitation onto the continent. However it is the end of the melt season, September, that will determine if Greenland gains or loses ice. The massive loss in 2012 and the gains in 2017 all had average accumulation by the end of May. Lack of clouds caused extreme melt in 2012, increased clouds very little melt in 2017. Not easy with the Grace gap. However it looks like it is doing similar to sea ice, with very reduced melting since 2012 after a decade of clear decrease. I wouldn’t go as far as to say it is a trend reversal. Hopefully over the next decade we can see a modest grow. I wouldn’t like to see a lot of ice growing. Our interglacial is long in the tooth. Javier, do you think the AMO has no or a minimal role to play in sea ice extent and ice loss/gain from the Greenland ice cap ? (https://tambonthongchai.com/2018/12/19/co2responsiveness/) and several other analyses. If we are not raising the CO2 level we cannot be increasing the temperature by burning fossil fuels. Maybe this observation would be a good subject for a future article Jim. My response is always, there is absolutely no consensus regards climate’s sensitivity to a doubling of CO2. Some IPCC experts predict 1 degree warming, others predict as much as 5 degrees. …….. So, Jim S is claiming …..“absolutely no consensus”, … HUH? And what does that mean, ….. DUH? Well, IMLO, …… obviously it means that there is absolutely, positively no proven association, correlation or factual evidence that atmospheric CO2 quantities of less than 6,000 ppm, …. be they decreasing, increasing or stable, ….. has any measurable effect whatsoever on the increases or decreases in/of near-surface air temperatures. [continuation of above quote] ……….. Nonetheless the scientific method demands, to prove rising CO2 is causing an effect like melting Greenland ice, we must show current changes exceed past natural variability. But most people are unaware that has yet to happen. So, exceed or not exceed …… “past natural variability”, … HUH? Well, it is MLO that it means that the Interglacial Warming (aka: natural variability) has to be disproven/discredited of being responsible for any/all recent melting of Greenland ice. And disproving/discrediting the above said would be an act of futility, …. an impossibility. Think you could explain your above verbiage for/to a comprehension “deficit” olbserver? And “DUH”, ….. iffen there is ….. “no consensus regarding climate’s sensitivity to CO2’s ability to warm the atmosphere”, …… then how can one honestly claim that atmospheric CO2 exacerbates near-surface warming? I mean like, …. no one can explain the existence of the Flying Spaghetti Monster ….. but most everyone infers, implies and/or suggests that he/she/it is real. And ps, …. Jim Steele, ….. if the scientific consensus is that … “increases in atmospheric CO2 directly causes increases in near-surface air temperatures”, … why is the aforesaid the ONLY example of natural world events whereby ….. “increases in temperature LAGS BEHIND increases in CO2”? Jim, please explain …. because this comprehension “deficit” observer is a seeker of scientific truths and facts. “HA”, my last 2 posts must have really “jerked-your-chain”, ….. didn’t they Jimmy boy, ….. given the fact you responded with this CYA, ……. “ROTFLMAO!”, …… apparently in hopes it would appease your “fans” hereon. One thing I am pretty durn sure of, Jimmy boy, is that you won’t soon be forgetting my “questions” that I ask of you. I’ve been talking with Nick over at his Moyhu site, getting some insights on his TempLS3 (soon to be 4) global anomaly s/w, and it turns out he has a very negative viewpoint on reporting uncertainty values or respecting significant digits. He says he’s not reporting on weather station temperature measurements, but instead is reporting on global anomaly calculations. Myself, if I’m starting from monthly rolled-up weather station temperature measurements, running a big least-squares calculation on them, and then publishing the results as anomalies in °C, I’d figure I was essentially reporting on weather station temperature measurements. It’s been pleasant talking with him outside the steam room this place must be for him, though he does view us as being wrong about practically everything, and one of his posters called WUWT a “viper’s den” and “a lightning rod for deniers,” as he talked about abandoning his fourth sock puppet over her. I replied that he should drop the puppetry and join us in a scientific discussion, and I’m sure that will go over there. It makes one realize how hard the alarmists work to deceive the public about what they know. Wasn’t the “gold standard” value from a while ago 99.99% or something around that? The average non-science-literate will take that to mean that they are 99.99% certain about AGW, but heck, every statistical result has some place somewhere that this is true. It’s just that the 99.99% confidence interval might be 50°C wide. There are reasons to use anomalies. But Nick likes to pretend that they are more accurate because the magnitude of the error gets smaller, refusing to admit that the statistics associated with T and delta T are different things. He throws temperature errors out the window, even though he’ll go blue in the face defending adjustments to historical temperatures that were not/would not be averted using anomalies. Where did Nick Stokes pretend that the magnitude of errors would be less when using anomalies? I only know from him (as from Roy Spencer) that removing seasonal cycles from the absolute data reduces the deviations from the mean, and hence the standard error. What accelerating sea level rise? Even the NOAA data shows there is no acceleration. Sea level has been rising for about 18,000 years and the current rate of rise is as low as it’s been since the start of that process. My note from December 4th. -Another year with a low degree of melting. Northern Hemisphere snow cover was within the normal range this winter. NA got to and is a way above. Of course, what matters is the extent of the snow cover during the sunny months. If the “extraordinary” cover continues through a third consecutive melt-season one could begin to discuss a trend change. Call me up when there is a crash of house prices along the California Coast. Particularly at Malibu. Me thinks Jim Steele is reading way too much into the guesses about the ice gains/losses, of the Greenland icecap. Specially about how it might affect sea level, within any of our known error bars ? Let me put you in my position. I am in a community where large segments of the population believes CO2 is accelerating Greenland’s ice melt, and as a consequence of melting like crazy it is raising sea level. Therefore there has been much internal strife regards spending money to build a seawall versus abandoning the coast and moving infrastructure inland. There is enough data showing Greenland has been losing ice since the late 1990s. Most people are swayed by predictions we will experience accelerating sea level rise to some degree! Do you not think it is worthwhile then, to educate people that Greenland is not on a course of linear accelerated melting, but Greenland gains and loses ice in an oscillating manner? Who can come up with evidence that CO2 even counts for anything in terms of “global warming”? CO2 is about one molecule in 2500. It would be truly miraculous if it amounted to anything. Add to this the amount of water (up to 100 times as much as CO2). My approach is to create a bench mark that the public can observe. If temperatures and melting do not exceed the 1920s to 40s, the public is more likely to reject the CO2 explanation and join the skeptics. I’m not a fan of this “It’s CO2” hysteria. But nevertheless, H2O and CO2 are the main atmospheric constituents able to prevent Earth’s infrared emissions from directly reaching space. N2, O2 and Ar are inactive gases wrt IR. And while water vapor is absent above 10 km due to precipitation, CO2 is distributed uniformly up to an altitude of about 50 km. But this is no more than layman’s opinion. Only real experts really know. There are two classes of glacier – mobile as with the example of the WWII aircraft and the stationary as drilled by all the deep core holes in the hinterland. Too me the fascinating part is where does the unconformity between the stable ice platform and the mobile glacier occur. While there is abundant age data from the cores of the deep and not so deep there seems to be little age data available from the more mobile glaciers. The two are quite separate systems.